Abstract: Additive manufacturing (AM) is poised to bring about a revolution in the way products are designed, manufactured, and distributed to end users. This technology has gained significant academic as well as industry interest due to its ability to create complex geometries with customizable material properties. AM has also inspired the development of the maker movement by democratizing design and manufacturing. 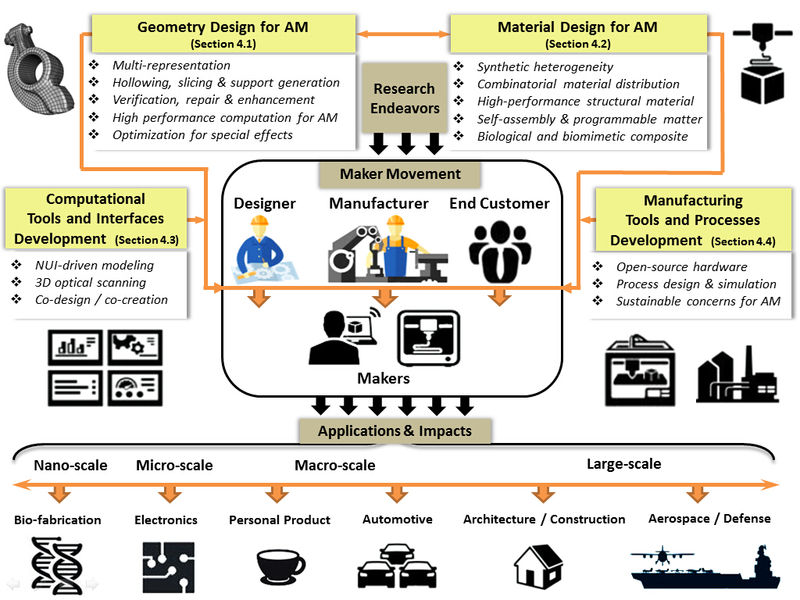 Due to the rapid proliferation of a wide variety of technologies associated with AM, there is a lack of a comprehensive set of design principles, manufacturing guidelines, and standardization of best practices. These challenges are compounded by the fact that advancements in multiple technologies (for example materials processing, topology optimization) generate a â€œpositive feedback loopâ€ effect in advancing AM. In order to advance research interest and investment in AM technologies, some fundamental questions and trends about the dependencies existing in these avenues need highlighting. The goal of our review paper is to organize this body of knowledge surrounding AM, and present current barriers, findings, and future trends significantly to the researchers. We also discuss fundamental attributes of AM processes, evolution of the AM industry, and the affordances enabled by the emergence of AM in a variety of areas such as geometry processing, material design, and education. We conclude our paper by pointing out future directions such as the â€œprint-it-allâ€ paradigm, that have the potential to re-imagine current research and spawn completely new avenues for exploration. Wei Gao is currently a D-PhD student in the School of Mechanical Engineering at Purdue. Mr. Gao received his bachelor degree (2009) in Mechanical engineering from the University of Shanghai for Science & Technology. His graduate research focuses onÂ design, simulation and optimization of foldable, reconfigurable and self-assembly mechanisms/robotic systems, and developing novel 3D printing technique based on FDM and building self-contained appliances that allow printing fully-functional objects (customizable products, articulated working models, self-actuated devices).